My own ‘comfort foods with Chinese characteristics’ have ended up being many and varied (Dandan noodles? Yes please! Pineapple sticky rice? Don’t mind if I do…) but my first love was the dish below: Disanxian. Disanxian sounds like Chinglish however you translate it (literally, the name means ‘Three Fresh Things from the Earth’), so I’ll stick with the pinyin. 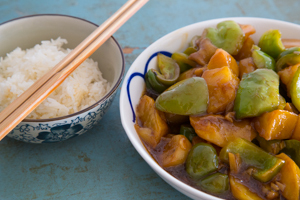 Potatoes, eggplant and green peppers are fried and then cooked again in a thick sauce flavoured with garlic, soy sauce and vinegar. Starch, check. Fat, check. It’s a simple, homestyle Chinese dish from North-east China that is sadly seldom found on restaurant menus, but the ingredients are so universally available that you can satisfy your disanxian urges on a whim, whether you’re in Beijing or not. 1) As with the recipe for Fish-flavoured Eggplant, you need to start with a scary amount of oil in your pan (how else d’you think this stuff gets so delicious?) – an inch-thick layer or so. Heat the oil until a small bit of potato starts to sizzle, then add all the potato wedges and fry until they’re golden brown. Scoop them out of the pan and drain/blot. Repeat with the eggplant – this step will seal the vegetables so that they don’t go too soggy in the sauce. 2) Tip out most of the oil, retaining just a few spoons in the wok. (Check out this website if, like me, you don’t know what to do with all that used oil.) Fry the garlic until it becomes fragrant, then add the peppers and stir-fry briefly. 3) Add the cooked potatoes and eggplant, then the liquid ingredients. Stir until everything is coated and then add the cornflour thickener and stir briefly. Once the sauce has thickened, serve immediately with rice. Yum I also totally forgot about this recipe – one of my favourites! Thanks for sharing! !